Bike-Eye's patented design is quickly changing cyclists opinions about bicycle mirrors, the long distance rear view and brilliant clear mirror reflection makes it easier to judge the distance and speed of approaching traffic. 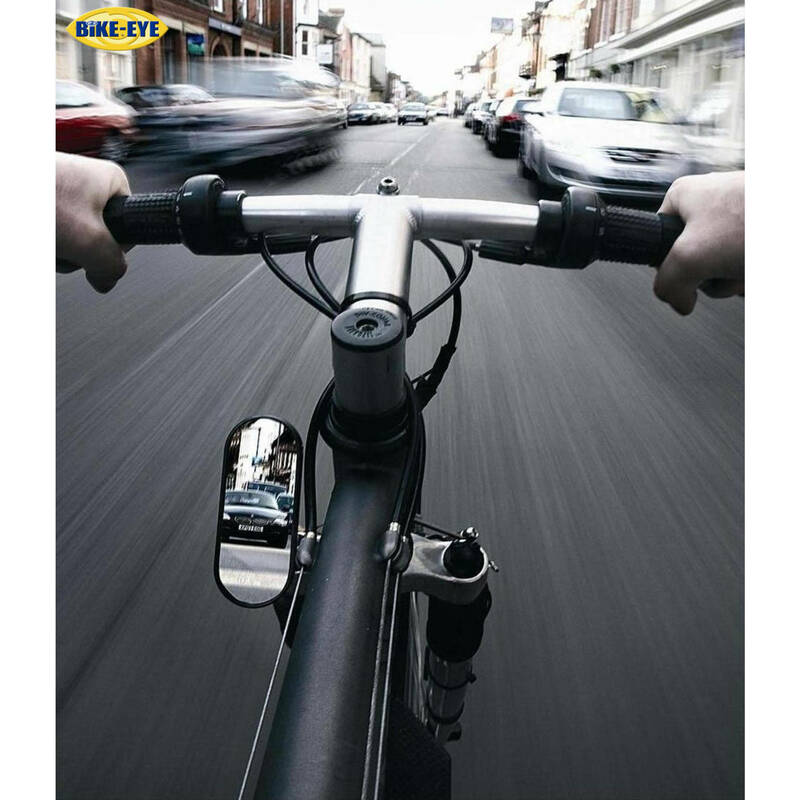 Bike-Eye gives a rear view through the correctly angled mirror under the rider's leg, along the line of the frame, therefore it's important a clear unrestricted viewing path must be maintained. The strategic positioning on the frame reduces the risk of knock damage or snagging and gives the mirror a virtually vibration free crisp image and can be easily adjusted for different riding positions. Carefully designed for most applications, Bike-Eye is fixed to the head and down tube in seconds using Ty-Rap ties, a quick simple frame friendly system that fits a large range of frame shapes and sizes. firstly this is the standard kit so it can be left or right side with the mirror high or low, it just comes assembled for the left side. its simple to change it to how you want it, it comes with the only tool you need. i have only used it a few times but i can see if something is behind me but not in any great detail so far, perhaps that comes with practice. its all i need, its simple and out of harms way. ConsMay not work if the viewing angle along the frame under your leg is not clear from obstruction! ProsUsed mine for 4 yrs still going strong. Not every product suits everybody but I find the comments from PS totally baseless, I can only assume he hasn't a clue about it's application, firstly it only needs a quick 1 second glance to see behind and you don't need to kick your knee out but there's no rule saying you cant if you want too. How big a blind spot do you get without a mirror! I've tried helmet mirrors and find them unworkable ( not useless ) for my style of riding, but I'm sure they work for the sit up and beg style of cycling which I assume PS is, by the way what happens if you don't wear a helmet? To actually question the Integrity of the high profile cyclist is bordering on calumnious, I know who I would trust. My suggestion would be to take a look at the video on the bike eye web site http://www.bikeeye.com/faqs.html to see how it really works then make your own mind up because that's how effective it is when I'm using it. The problem I've found with this is you have to angle your leg uncomfortably outwards to see back behind yourself. However, even once I have done this, I couldn't see past my rear pannier. Mirrycle's Mirrors are much better, I'm sticking with those.